Search and adopt a Papillon near you. The Papillon (French for "butterfly") is a small, friendly, elegant breed of dog. Distinguished from other breeds by its large butterfly-like ears. The Papillon is one of the oldest of the toy Spaniels. Papillons were bred for companionship, and make excellent alarm dogs. Papillons are usually parti-colored (white with markings of any color). An all white dog or a dog without white is disqualified from the conformation show ring.  Tri color which is the least common color of this breed. The most distinctive feature of the Papillon is its large ears, which are well fringed with colored (not white) silky fur. The color covers both eyes and the front and back of the ears to give the perfect butterfly look. A white blaze and nose band is preferred over a solid-colored head. The nose, eye-rims, and lips should be black. Paw pads vary in color from black to pink depending on the coloring of the dog. The Papillon is considered to be a "wash and wear" breed not needing excessive grooming. Papillons have a coat of fine fur, a single length coat. 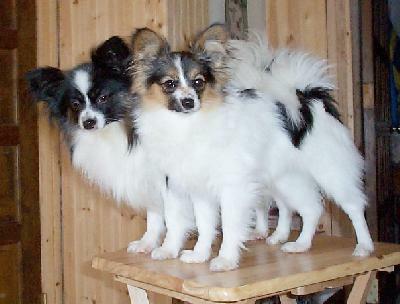 As puppies, Papillons have short length fur and as adults, the coat is long and silky, plush to the touch. There are two ear variations of this breed, the completely upright ears of the Papillon, and the dropped spaniel-like ears of the Phalène. The American Kennel Club and the Fédération Cynologique Internationale consider the Phalène and the Papillon to be the same breed. The Papillon coat is abundant, long, and silky, with out an undercoat. Ears are well fringed with the inside covered with silky fur of medium length. Tail long, well-fringed, set on high, arched over back with fringes falling to side to form plume. The head is slightly rounded between the ears, the muzzle is fine, tapering, and narrower than the skull. Height: 20-28 cm (8-11 inches), over 11 inches is a fault and over 12 inches is a disqualification from the conformation show ring. Weight: 7-10 pounds (3–5 kg), but they can also get up to 14- 16 lbs. The Papillon has the appearance of a dainty toy breed, but many owners claim that their dogs are "big dogs in little dog suits". The Papillon is very capable of handling a good five-mile walk. An aspect of the Papillon that has led many to believe the "big dog" assertion is this breed's surprising athletic ability. In contrast to its stately representation in the Old Master portraits, the Papillon is highly energetic and intelligent. The breed is far older than any other represented by the AKC and is more notable for its psychological abilities than its athletics. The Papillon's true strength lies in its ability to perceive the emotional needs of its owner and then translate them into a healthy psychological environment. In other words, the animal becomes what the owner needs, depending on the circumstances. Provided their genetic structure is sound, and not the product of "puppy mill" inbreeding, they are generally healthy animals. Papillons are built to move, and most do not need any encouragement to apply their energy to athletic activities. In recent years, the Papillon has become a star in the sport of dog agility. This sport consists of an obstacle course including tunnels, jumps, A-frames, and narrow bridges that a dog completes at top speed aided only by verbal and body-language commands from a handler. Agility requires the dog to spring, scramble, weave, and turn on a dime. The breed is considered naturally agile, and Papillons compete at both national and international levels. Because many Papillons have intense drive and natural speed, their tiny turning radius gives them an edge over larger dogs, and some Papillons are actually capable of beating Border Collie speeds on some courses. At the same time, Papillons excel in companionship and lap dog sweepstakes, and take this very seriously. Others have experienced Papillons as highly companionable—yet physically active—dogs requiring appropriate socialization, consistent and monitored exercise, continued training (which also serves to stimulate their active minds), and daily, proactive human-to-canine interaction.